This article was originally published in Country Life in April 27. The Diamond Jubilee issue of Country Life is out today. a motte-and-bailey castle built to guard the river crossing, and was originally owned by the De La Warr family. Then, in 1508, the Isfield estate was bought by the influential Sir John Shurley, cofferer to Henry VIII, who built himself a mansion on the site to accommodate his many guests, including high-ranking officials from the royal household. In the 17th century, Isfield Place was further extended by Sir John’s descendants, and, despite being reduced in size in the early 18th century, has always been one of the county’s grandest houses. In the mid 1800s, the estate was tenanted by a farming family, the Manningtons, before being sold in the early 1870s to prominent local landowner Henry King, who converted the manor house for his own use, adding a new north-east wing, restoring outbuildings and garden walls, laying out the formal gardens, and making substantial alterations to the interior. In the early 1900s, his son, also Henry King, transformed the enclosed gardens to the west and south of the house into an Arts-and-Crafts style ‘gardens of rooms’. 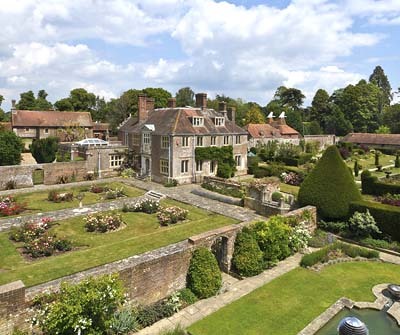 Today, Isfield Place, listed Grade II*, is roughly half the size of the original Jacobean mansion built by the Shurleys, but it still enjoys the same degree of privacy and security, thanks to its idyllic setting at the heart of its 311 acres of land, with no public rights of way near the house or gardens and glorious unspoilt views towards the South Downs. With its turreted walls and bastions, the irregularly shaped, three-storey manor house, built of red brick under a tiled roof, is an inspiring sight from any angle. The entire estate, which has been further improved and refurbished in recent years, is now for sale through Savills (020-7409 8882) at a guide price of £9.5 million. the magnificent fitted kitchen, which has spectacular views across the formal gardens. In all, the house, which is remarkably manageable for its age, has entrance and reception halls, three main reception rooms, billiards and rod rooms (the estate offers sea- and brown trout fishing, as well as an established shoot), eight bedrooms and five bathrooms. Further estate housing includes a two-bedroom chapel flat in the former Victorian stable block, a three-bedroom butler’s cottage and a two-bedroom gate lodge. A two-storey oast house next to the swimming pool has lapsed planning consent, granted in 2006, for conversion to ‘guest accommodation and ancillary facilities’. But the major con-tribution made by the Bellis family to the well-being of the Isfield Place estate is undoubtedly the transformation of the estate farm into a registered organic enterprise raising Sussex cattle, Kent sheep and Large Black pigs. A few miles north in Surrey, intriguing Kingsmere House at Burhill, Walton-on-Thames, originally known as The King’s House, was conceived in 1935 by the Royal Warrant Holders’ Association as a gift for George V, on the occasion of his Silver Jubilee. Built on land donated by the Earl of Iveagh, the relatively modest, 5,586sq ft, two-storey house has four reception rooms, four bedrooms, a staff annexe and a swimming pool. It stands in two acres of grounds beside the 10th hole of the challenging Old Course at Burhill Golf Course, created in beautiful parkland by the Guinness family in 1907. Using only materials sourced from within Britain and the Empire, such as Indian silver door handles and Maltese marble floors, The King’s House was intended to be ‘an example of English craft and taste, a memorial of a reign which has seen our land pass happily through the greatest ordeal of its history, and a fitting tribute to a Sovereign who has made of his people not only a Nation and an Empire, but a Household’. Sadly, George V died in 1936 and never lived there, and the property became part of the Crown Estate, being used as a grace-and-favour residence until 1954, when it was sold into private hands. Kingsmere House is on the market through Hamptons International (01932 859933) at a guide price of £3.5m. Largely unaltered during the present owners’ time, it retains a wealth of regal features, such as the crown patterns above the door and on the Juliet balcony to the front of the house, not to mention the service buttons in the bath-one for the valet, another for the maid. From a king’s house, to the sport of kings. The sale of Bill Gredley’s palatial, 116-acre Stetchworth Park estate and stud near Newmarket, through Savills (020-7016 3780) and Bidwells (01223 559352) at a guide price of ‘excess £11 million’, offers a rare opportunity for a serious racing enthusiast to acquire a historic, state-of-the-art breeding operation at the heart of Britain’s racing headquarters. The stud offers 24 boxes, its own paddocks, a six-bay horsewalker and isolation boxes. Stetchworth is also home to the competition yard run by Mr Gredley’s son, international showjumper and Olympic hopeful Tim, which boasts 22 boxes, indoor and outdoor arenas, and a life-size replica of Hickstead’s famous showjumping course. It has recently been used as a training ground by the 2012 Olympic team. The village of Stetchworth has long been associated both with the National Stud and Newmarket’s July Course, which fall within the parish boundary. Two previous houses have stood near the site of Grade II-listed Stetchworth House. The second house, dating from the 1640s, was demolished by Richard Eaton, who bought the estate in 1786, and built the present house shortly afterwards. Further additions were made by the family in 1870. In 1883, the estate was bought by Francis Egerton, 3rd Earl of Ellesmere, who founded the original Stetchworth Park stud. Successive Earls of Ellesmere carried on the family’s racing tradition. With its trademark Georgian high ceilings and large sash windows, Stetchworth House combines the grandeur of a classic manor house with the comfort and feel of a family home. All the rooms in the eight-bedroom house have been individually designed to tell a different story: the agents describe the interior as ‘an artist’s dream’. The garden room in particular, being glazed on three sides, provides wonderful views over the surrounding gardens and parkland.